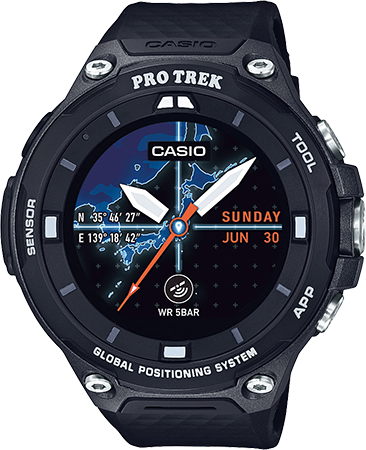 The Casio Pro Trek lineup is an Android-specific (IOS-compatible) “smart watch” series to keep you connected whether on a lunch break trail run, an after-work bike ride, or a weekend-long backpacking, skiing, fishing, or paddling trip. In today’s world, a lot of us, including myself, like to stay “connected”. We like to maintain access to email, follow along on social media, and track workouts/outdoor activity. The Casio Pro Trek WSD-F20 does all of that and more. First, as a “smart watch” this watch features the Google Play Store allowing users to download just about any app available on a phone (Gmail, Instagram, Facebook, Snapchat, etc.). Second, it features some great tools including a very accurate compass, altitude monitor, and most importantly, activity mapping for climbing/trekking, biking, paddling, fishing, and snow. And third, though some improvements could be made, this watch is rugged enough to withstand months of abuse, yet sleek enough to not be overly obtrusive on my arm. Pros: GPS and offline maps are awesome. The Pro Trek allows users to track activities and export maps/tracks directly to the Google Drive in a .kml format, allowing users to view the track in Google Earth. The latest version of this watch features Android 2.0, and allows users to drop “points of interest” along a track; but best of all, the map has an incredibly detailed zoom and terrain or satellite view when offline — even when you’re in the middle of the backcountry, with no service, which is exactly when you need them. The fit and finish of this watch are very nice. As a women with a relatively small wrist, the watch does not look entirely out of place and is a good weight, making it relatively non-obtrusive. Though it took a week of wearing it to break in the watch band (it was a little stiff at first), it now fits very comfortably. Additionally, the “techy” side of the fit and finish is really impressive. Specifically, users have multiple “faces” to choose from, from monochrome time/date to time/date/battery indicator and even more with time/sunrise/sunset information. The Pro Trek is very durable. After two months of nearly constant use, the face (which is very similar to a cell phone screen) is free of scratches and the band is free of any scrapes or dings. One note on the face: It is not polarized lens-friendly. To view the status of an activity, notifications or read email, sunglasses must come off. At the heart of the WSD-F20, users have a “timepiece.” This is a classic, functional watch, so even when the battery is too low to stay connected to a cell phone, the time/date information is still readily available. Cons: There is a bit of a learning curve with this watch. As a dedicated Android operating system user and relatively tech-savvy millennial, I tend to respond well to high tech gadgets, but the interface took a little getting used to. With that said, after a week of experimenting and constant wear, I grew to understand the internal navigation and features (and I like them). The battery life could be better. After a morning of skiing in “activity mode” (~4 hours), the battery lost about 35 percent. On a weekend bike/camping trip (in tracking mode while moving), my battery was zapped by the morning of the second day. A little extra battery life could be juiced out of it by turning off some features, but many of the functions/reasons for a “smart watch” are lost. The watch does not track heart rate. If that’s a critical feature for you, this might knock the WSD-F20 out of the running. The battery charger needs a revamp. Currently, the watch features a round, magnetic battery port with a watch-specific charger. This means carrying an extra cord along and it makes it very difficult to charge on the go, in fact, I found myself reconnecting the charger multiple times when attempting to charge on the road. The magnet is strong, but not strong enough, and if users are in an environment with metallic rock (like Colorado’s San Luis Valley), magnetic debris easily blocks the charger port from an efficient charge. Where We Took It: I used the Pro Trek for two months as a daily timepiece, step tracker (via Google Fit) and mail/social media notification center. I also used it for activity tracking on a weekend bikepacking trip in southern Colorado, several “dawn patrols” and downhill ski days at Wolf Creek Ski Area, and fat biking in the Rio Grande National Forest.